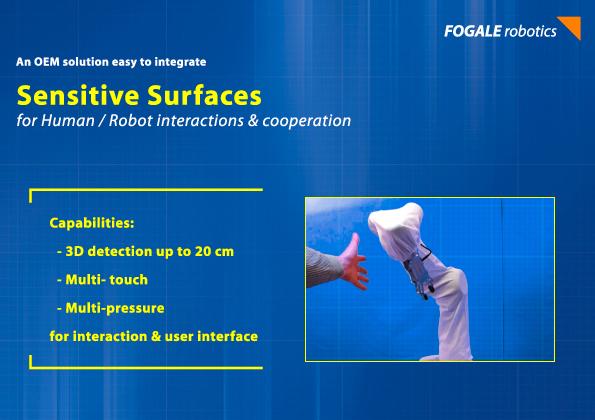 FOGALE robotics, subsidiary of FOGALE nanotech, introduces a new Sensitive Surface Technology to provide an extended sense of touch for your robots, allowing approach, contact and pressure measurements. It includes a flexible skin with a high density of sensors covering robot’s surfaces, and enabling objects and human operators detection in its surroundings with a high degree of reliability and robustness. The robot can thus adapt its movements in real time in changing environments, to improve operation safety, adaptability and advanced cooperation with human operators. Fogale Sensitive Surface Technology provides therefore superior capabilities to your robots, regarding safety, flexibility, adaptability, speed & productivity.